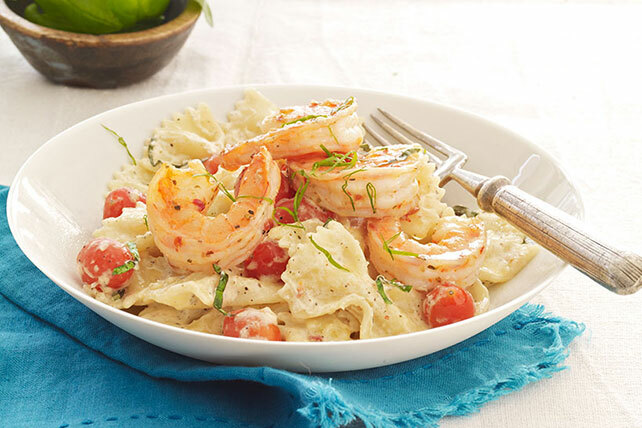 Create an impression with Creamy Tomato-Basil Pasta with Shrimp. Our Creamy Tomato-Basil Pasta with Shrimp is very close in taste to a high-end entrée. Cook pasta as directed on package, omitting salt. Meanwhile, heat 2 Tbsp. dressing in large skillet on medium heat. Add shrimp; cook and stir 2 to 3 min. or until shrimp turn pink. Use slotted spoon to remove shrimp from skillet; cover to keep warm. Discard any drippings in skillet. Add remaining dressing, broth and seasonings to skillet; cook 2 min. or until heated through, stirring frequently. Add Neufchatel; cook and stir 2 to 3 min. or until melted. Stir in tomatoes; cook 1 min. Drain pasta. Add to ingredients in skillet. Stir in Parmesan and half the basil; top with shrimp and remaining basil. Fresh shrimp should be firm, moist and translucent and should smell like the sea. Avoid those with black spots and any trace of ammonia odor. They can vary in color from grayish-green to pinkish-tan to light pink. Place in a bowl (if wrapped in plastic, punch a few holes in the plastic) and store in the coldest part of the refrigerator up to 1 day. Slice large-leafed herbs such as basil and mint, into thin strips by stacking several leaves on top of one another. Roll the stack lengthwise into a cylinder. Using a sharp knife, cut the cylinder crosswise to form fine shreds. This cut is called chiffonade. Be sure to use a sharp knife - a dull knife will bruise the leaves while cutting.